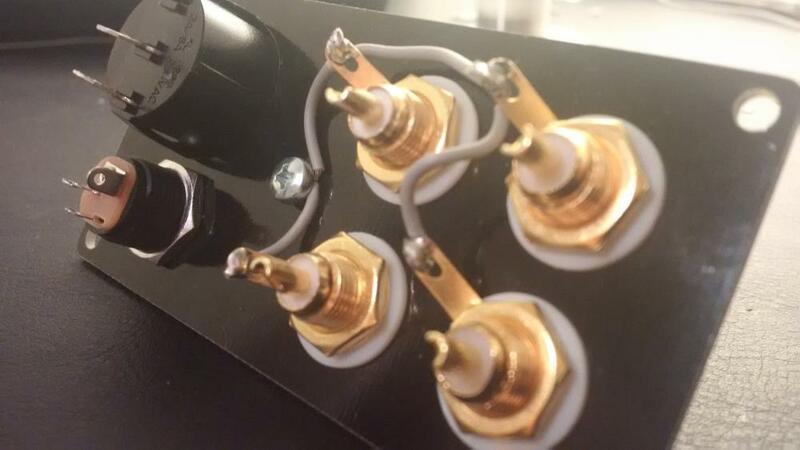 With the phono stage and the back panel built, you can now connect the audio wires. Next in line is to cable the input and output RCA connectors. You will need two audio cables, one for the input and one for the output. The lengths of the cables are decided by the distance between the phono stage and the back panel. The cable used here is a two-lead audio cable with shield. You should always use a shielded cable for the audio input, as the signal from your turntable is very low. Such a cable is of course included with the Muffsy Phono Preamp Kit. I decided to use the top RCA connector for the RIGHT CHANNEL, so the RED cable goes in the center of the top connector. The WHITE cable, which is the LEFT CHANNEL goes in the center of the bottom RCA connector. The shield of the cable goes to either one of the "pins" of the RCA connectors, as they are all connected to each other. 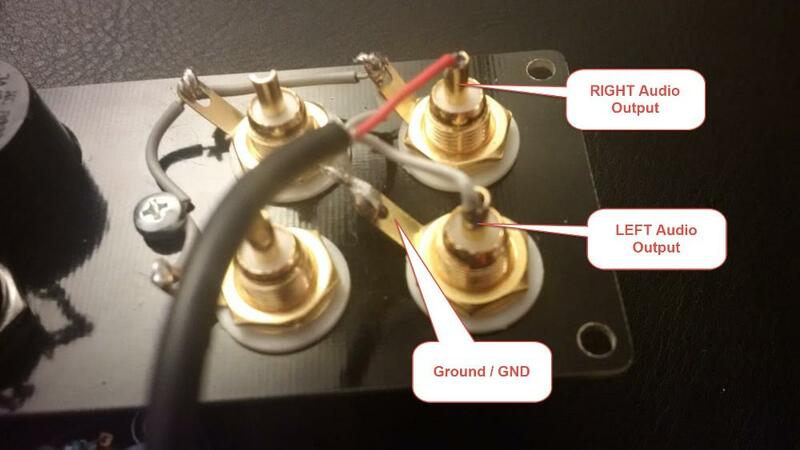 Use another audio cable for the audio input and connect it in the same way, and connect the ground screw to both input ground pins. Your back panel audio wiring is now done. 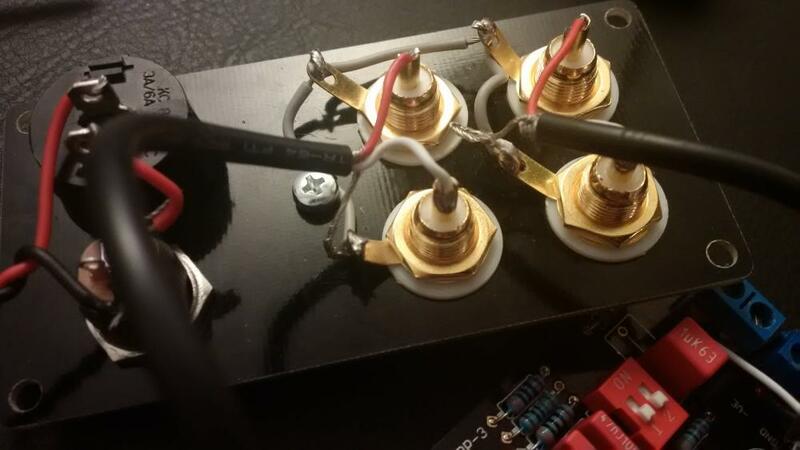 It is advised to keep the input side of the phono stage board closest to the back panel. Keeping the input cable as short as possible will help avoid interference, and the cable capacitance will be kept to a minimum. Should you decide to use unshielded cables, make sure to twist or braid them to avoid any unnecessary noise entering into the circuit. 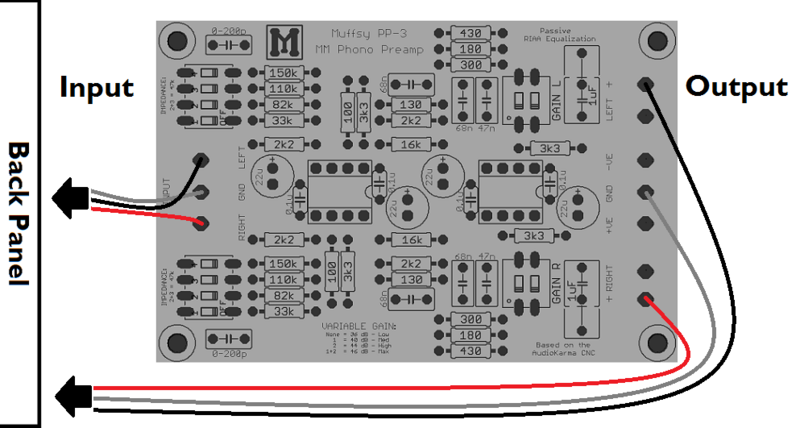 With this step done, you have finalized the audio wiring, and you are ready to go on to powering the Muffsy Phono Preamp..